What's new at Holy Family School? The Knights of Cloumbus are hosting an Easter Egg Hunt on Saturday for children ages 0-10 years old Holy Family School field at 2 p.m. Bring a bag or basket for all of those eggs. Registration for football at Notre Dame High School for grades Kindergarten through 8th grade are now open. The coaches are looking to build up the Competitive Flag and flag programs geared for kids 4-7 years old, which Mr. Daniel Reeves will be involved in heavily. As for ALL divisions - If you want a Huge discount, please register at the link below by ‪April 15 in order to save up to 33 percent. You can register online at ND Crusaders. * please note that most 12 year olds in the 7th grade will default to the Middle School team at registration, but roster assignments will be finalized in the summer (based on weight, experience, ability, and roster needs). Fees are as listed below. Early registration discounts may apply, as noted below, as long as players are registered by ‪4/15/2019. Late fees may also apply for registrations ‪after 8/1/2019. Cyber bullying is a problem plaguing schools across the country. In an effort to stop it before it starts, Holy Family School hosted Melissa Perracchia, from the Crime Victims Council in Easton, to talk to third through eighth grades separately. She tailored her talk for the maturity of each grade level. Perracchia told the classes that statistically 75 percent of students are cyber bullied. Only one in 10 report it to an adult. Cyber bullying or online bullying occurs when someone, usually anonymously, bullies another person through digital means in order to torment, threaten, harass, humiliate or embarrass him. Perracchia said the cyber bullies have a variety of tactics that include trolling, impersonation, outing and exclusion. Trolling involves posting something that will get people to argue. Impersonation is posting something under someone else’s name either by pretending to be someone else or by using someone else’s account. Outing is sharing embarrassing information about someone. And exclusion involves purposefully leaving someone out of an event, conversation or group. Perracchia told the students to not join in with the bully. It is better to block or unfriend the bully, stand up for the victim and offer that person support. Cyber bullying can hurt the victim’s feelings, reduce his self-esteem, and cause him to feel helpless. It can also lead to poor school attendance, and serious issues such as cutting, drug and alcohol abuse, and suicide. If they see bullying going on, then they can help as an active bystander but be cautious, too. Help can be given to the person either directly or indirectly. Telling an adult is one way to help. The Holy Family Athletic Association is taking reservations for it's annual Sports Banquet. The banquet will be held May 31 in the Holy Family Parish Center. If your child played a sport this year and you would like to attend please click here for the reservation form. The CYO would also like for families to send any pictures of athlete/team portraits or team practice/game/meets to hfaasecretary1@gmail.com for the slide show. Our Lady of the Sacred Heart Council 4282 of the Knights of Columbus will host three Lenten Fish Bakes from 4 to 7 p.m. on March 29, and April 5 and 12 at the Holy Family Club on West Mauch Chunk St., Nazareth. Dinner includes: breaded or plain baked fish, Manhattan Clam Chowder, vegetables, stewed tomatoes, red potatoes, cole slaw, dessert, coffee or tea and peanut butter and jelly sandwiches for those who don't want fish. And it costs $12 for adults, $5 for children 6 to 12 years old, and children under 6 are free. Funds raised from the dinner and Tricky Tray go to benefit several organizations and scholarships for graduating eighth graders who plan on attending a Catholic high school. Local author Chrysa Smith stopped by Holy Family School recently to talk about her books and read one of them to the children in preschool through third grade. Smith had planned to make her visit during Catholic Schools Week, but the weather didn’t cooperate. Her visits to Catholic schools for the weeklong celebration are free. “That’s my way of giving back,” she said. A Catholic school student herself, Smith went to St. Nicholas of Tolentine Elementary School and St. Francis Preparatory School, followed by St. John’s University, all in New York City. Smith said she does about 40 school visits a year. She likes to talk to the children about writing and does writing workshops as well. Smith said she hopes the students take home with them a desire to write their own books and the feeling that writing isn’t so hard. After years of writing for magazines, Smith, who now lives in Quakertown, began writing children’s books in 2008. Smith said she had the bright idea for her books while she watched her poodles play one day. “They were doing things that are funny,” she said. “I love dogs, so when I got one, I got more,” she said. During her talk, the children had many questions for her including how she comes up with her ideas for the books. “I take stuff that is real and mix it up with stuff I come up with,” she told the first-grade children. Smith said it takes her almost a year to take an idea for a book, write it, edit it, get it illustrated, and put it into print. In addition to the Poodle Posse books, she also writes some other tales. One of them, “The Upside Down Gardener,” she read to the children. 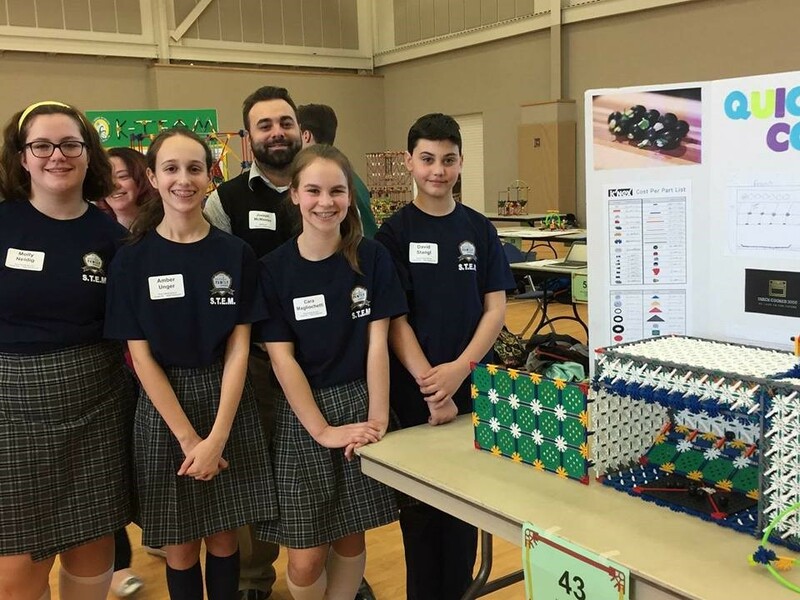 The Holy Family School STEM team competed against 64 other schools on March 8 at Northampton Community College Monroe Campus. They didn’t win, but their coach didn’t see it that way. “I told them that I am extremely proud of them and to keep their heads up. It’s a tough life lesson, but sometimes even doing your best may not be enough. But as long as you know you tried your hardest, you are a still a winner,” said Joe McMaster, their coach and computer teacher. The team consisted of Amber Unger and Cara Magliochetti, both in eighth grade; Emily Olsen and Preston Santos, both in seventh grade; Keegan Ramsey, Haidyn Searls, Mary Silimperi and Abigail Halldorson, all in sixth grade; Sam Joseph, Derek Fulmer, Aidan Dalton and Caeden Scaglione, all in fifth grade. The teams, which came from across Pennsylvania to the competition, were asked to create a machine that would move three objects at least six inches across a table. McMaster said the crane-like device had to be able to pick up the object, move it and set it back down. The team could choose what objects they were going to move. The team was also asked to present a report on their machine and to what degree it is environmentally-friendly. “They have worked extremely hard in preparation to compete,” McMaster said. The students were accompanied by chaperones are Karen Unger, Jeremy Silimperi, and Scott and Kimberly Scaglione. The newest edition of the school's online newspaper "The Call of the Faith" is out. Click on the link to read all of the stories written by students here at Holy Family School. Music is his first love, but when author Alan St. Jean, of Columbus, Ohio, decided to write children’s books, he also decided to incorporated his musical skills into videos that explore the art of storytelling. to tell a story,” St. Jean said about the videos. St. Jean presented a couple of assemblies at Holy Family School during Catholic Schools Week that opened up the world of storytelling to the students. Originally, he had planned to hold writing seminars with the students in fourth through eighth grade and an Author Olympics, but then the Polar Vortex descended into the area. With one day left after three Snow Days, he maximized his time and gave two assemblies: one for the whole school and one for the fourth to eighth graders full storytelling tips. “There’s no greater satisfaction than when I see the kids excited about writing,” he said. St. Jean approaches teaches writing techniques by having each class come up with the characters, the plot, the issue with it’s twists and turns and the conclusion. St. Jean said he wanted to make writing fun and inspire children to write and let their imaginations run. “Writing is like going on an adventure, but you control it,” he said. Is Tricky Tray on your calendar? Mark your calendars for the upcomng Tricky Tray and International Food Celebration on March 22-24. The Home and School Association has been working hard in organizing their next big event. For more information, check out the Home and School Website. Looking ahead to April, the next eat out and help the school will be right on the first day (April Fool's Day), but this is no joke. Go to Chipolte and the school gets a percentage of your bill. Fantastic! And don't forget to use a Cash Card. The Learning Express is also offering to donate back to the school 10 percent of your bill that evening. More information to come. Many people love bacon, ham and pork chops, but laying a kiss on a swine isn’t exactly what some have in mind when they think of their love of pigs. This of course is why the contest is so much fun for the students. At the end of April, five lucky educators will have the golden opportunity to plant a big one on some lucky pig. The first of three competitions began in February with all of the classes coming up with a theme for their classroom door. They decorated their doors, and the winners were announced on Feb. 15. Second place went to Mrs. Ecker’s second-grade class. Their theme was “When Pigs Fly,” which may be what Mrs. Ecker is thinking in regards to kissing that pig. They will get 10 tickets. The third place award went to Mrs. Guarino’s sixth-grade class for their Iron Pigs theme, complete with the symbol iron, Fe, at the top of the door. The will get five tickets to select their favorite pig-kissing teacher. Although the other teachers didn’t win, they had some impressive ideas. Mrs. Banghart, the school nurse, chose Swine Flu as her theme. First-grade teacher Mrs. Christ kept with her Peanuts-themed classroom and put up a picture of the cartoon’s lovable character Pigpen. Mrs. Cummings fourth-grade class went with the nursery rhyme “This Little Piggy.” And even the preschool full-day, four-year-old class got in on the action by making piggies from their handprints in pink paint. To see all of the doors, check them out on the school’s Facebook page. The students have already had an opportunity to begin purchasing tickets to place in the jars corresponding to the teacher they want to win. The tickets cost $5 for three. Beginning in March, tickets will be sold after each of the masses for parishioners to get in on the fun. The school will also run another competition between classrooms—a Weekly Coin & Bill Challenge. 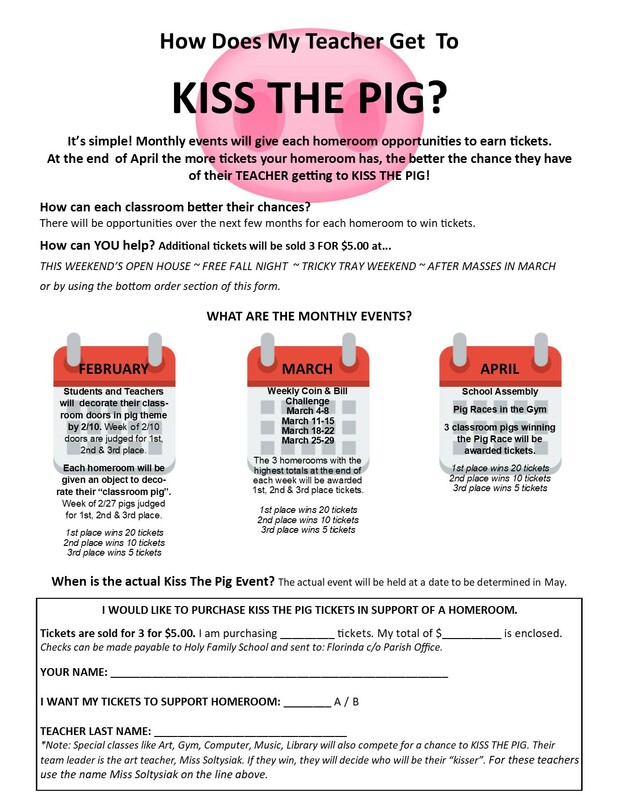 Students will bring in their loose change and dollars and the top three homerooms with the most money at the end of each week will win tickets to vote for the pig kissers. Once again, first place gets 20 tickets, second place gets 10 tickets, and third place gets five tickets. By the end of March, those tickets are going to be piling up. The more tickets, the more likely that teacher will have his or her ticket drawn. In April, there will be pig races and three classes will win the last packets of tickets. Check Facebook for updates and pics. Put your cell phone down, turn off the television, close-up shop on the video games and come out to Holy Family School for Game Night. Reconnect with your family with some healthy, strategic competition the way we used to do as kids. It's a lot of fun! Sign-up fpr the 2019 Track and Field season is Sunday, Feb. 10 and Sunday, Feb. 17 at the Holy Family School gymnasium from noon to 1:30 p.m. Children in grades Kindergarten through 8th grade may register. Holy Family School has taken another step into introducing more technology into its curriculum. This time, it’s a 3-D printer in the computer lab. Joe McMaster shows off the new 3-D printer in the computer lab. McMaster intends to use the printer as part of his curriculum and have his students create a variety of objects from small toys to animal figures and anything they like. The school received the AFINIA 3-D printer about a month ago. It is the usual size purchased by schools with the printing area completely enclosed. In addition to the printer, the school also purchased several reels of PLA plastic cord. The printer is also capable of printing with wood, metal, and even glass. McMaster said he hasn’t tried out the new printer yet, but he uses a similar one on a daily basis at the Nazareth Library, where he has also works. “I am hoping to be up and running by the end of Catholic School’s week,” he said. The students are looking forward to it, too. Holy Family School students, staff, family and friends welcomed 23 students in the seventh and eighth grades into the school’s first chapter of the National Junior Honor Society. The induction ceremony was held on Dec. 18 in the gymnasium. The members of Holy Family School’s first National Junior Honor Society include from left to right: Nick Dang, Amber Unger, Maxwell Kochenash, Emily Pezzuto, Sophia Hahn, Collin McCallister, Noah Zacharia, Graceann Mattair, Cara Magliochetti, Clare Duffy, Vanessa Amrick, Celine Bassil, Jackson Bruce, Claire Daukshus, Preston Santos, Emily Olsen, Nathan Thomas, Claire Martocci, Charlie Wyke, Elizabeth Ecker, Gianna Caiazzo, Jacob Cardozza and Brittany Nestor. They were inducted into the organization on Dec. 18. The new NJHS members include from the eighth grade: Vanessa Amrick, Celine Bassil, Nick Dang, Clare Duffy, Sophia Hahn, Maxwell Kochenash, Cara Magliochetti, Graceann Mattair, Collin McCallister, Emily Pezzuto, Amber Unger and Noah Zacharia. From the seventh grade, the members include: Jackson Bruce, Gianna Caiazzo, Jacob Cardozza, Claire Daukshus, Elizabeth Ecker, Claire Martocci, Brittany Nestor, Emily Olsen, Preston Santos, Nathan Thomas and Charlie Wyke. “I am beyond proud that Emily has been chosen to be a part of the National Junior Honor Society,” said Melanie Olsen, whose daughter became a new member of the society. In order to be inducted into NJHS, students had to achieve a cumulative grade point average of 90 percent or higher for two consecutive trimesters, as well as an “S” or higher in all minor subjects. The students must also maintain a clean discipline record. Membership in other activities is encouraged. Nearly half of our seventh and eighth grade student body fulfilled these strict requirements. Each inductee was presented with a certificate by Mrs Christine Bruce, the school principal. Heavilon said the group will meet monthly. Each member has to complete 10 individual service hours each year, and the group will take on a service project. And some of the members of the society will help their fellow students by tutoring them. 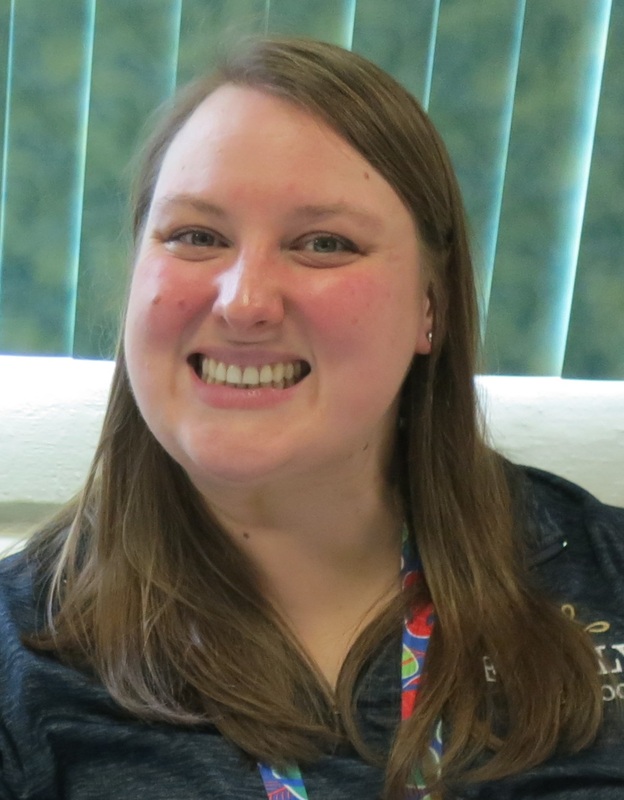 As an advisor for an NJHS at her previous school, Heavilon said her students were able to “take on roles that they otherwise wouldn’t be exposed to.” This is why she wanted to pursue bringing NJHS to Holy Family School. “This is a chance for them to develop as leaders,” she said. Check out the newest edition of "Call of the Faith"
The newest edition of our school newspaper, "Call of the Faith," is now available online. It is our eighth edition! Kickoff Catholic Schools Week with a bouncing good time at Freefall Trampoline Park in Bethlehem. Show off your school spirit and wear your Holy family School Spiritwear shirt. We have the center reserved just for us, but you can bring a friend along, too. The date is set for Sunday, Jan. 27 from 6:30 to 8:30 p.m. It costs $16 per person (a $23 value), and you can get pizza for $2 a slice and soft pretzels for $1 each as well. Ticket orders must be returned to the school by Jan. 18. See the ticket order form for details. Holy Family School’s Student Council is off to a good start. In just a matter of weeks, the council has held appreciation days for our cafeteria workers and the school bus drivers. Students from nine school districts come to our school, which include Bangor, Bethlehem, Easton, Nazareth, Northampton, Pen Argyl, Pleasant Valley, Stroudsburg and Wilson. Student Council Vice President Cara Magliochetti, also in eighth grade, is all in for fundraising. Unger also hopes to start Movie Day for each grade as a bonding and rewarding event. Maxwell Kochenash said he enjoyed be secretary of Student Council last year, so wanted to continue in the roll in eighth grade this year. New to the council is seventh-grader Jackson Bruce. He is serving as the treasurer this year. The Scholastic book fair “Enchanted Forest: Let Your Imagination Grow” brought in a little more than $4,500 for Holy Family School, and sold 708 books. This equates to 127,440 minutes of reading, said Book Fair chairperson Joyce-Anne Schuster. The total sales were $4,509.38, and Schuster’s goal was $5,000 for purchases. “We were close. I’m hoping we can meet that goal in the spring,” she said. The Spring Fair will be held April 29 to May 3. The fall book fair had plenty of World War II books available for budding history buffs, but Schuster said she highly recommends “Number the Stars” by Lois Lowry. It was her favorite book when she was in school. She also did a little reading between class visits during the fall book fair. “I was also glad I had time to read ‘A Dog’s Purpose.’ It was an amazing read,” she said. Just when you thought you'd have to make dinner, the Home and School Association gives you another opportunity to go out. 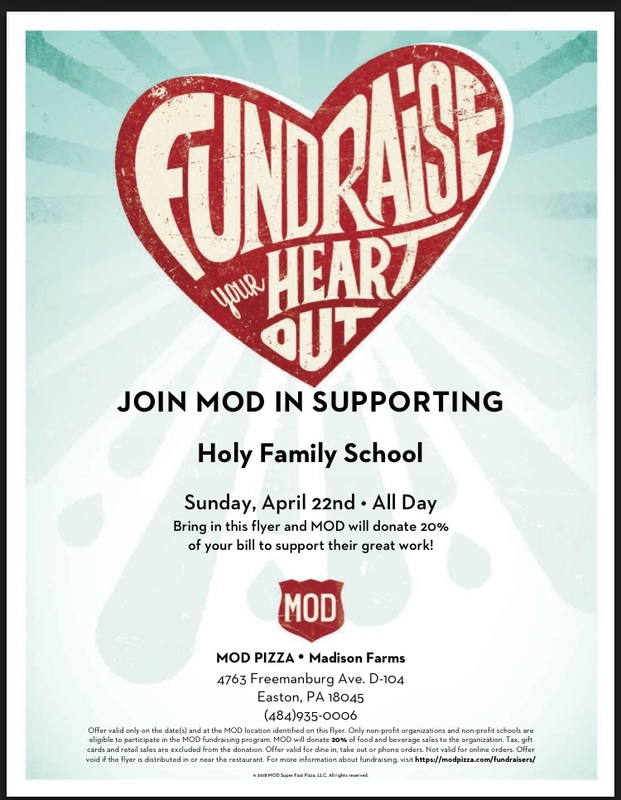 On Sunday, Dec. 16, MOD Pizza in Easton will give HFS a portion of all proceeds during that day. But you have to show the flier! Click here to get it. And thank you to everyone who came out for the Holy Family School Barnes and Noble Bookfair and dinner at Texas Roadhouse on Friday, Nov. 30. This year's Pumpkin Decorating Contest produced some fantastic pumpkins. Children in grade Kindergarten through fifth grade and their families put their heads together to come up with some pretty cool designs. The pumpkins were decorated in five different themes: Creative, Scariest, Cutest, Animal, and Religious. Creative: McKenna Mason, 1A, for Drippy Rainbow; and Gina Favocci, 5A, for President Trumpkin. Scariest: Brody Gheller, Kindergarten, Spooky King Tut. Cutest: Tyler Coad, 2A, Strawpump; and Ava Panetierre, 5A, Sprinkles the Unicorn. Animal: Mia Ambrosia, 1A, Isabella; and Evelyn Bonventre, 5A, Hedwig. Congratulations to all of our winners and families who took part in this activity. Holy Family School Volleyball team’s service project this year is to take up donations for Mary’s Shelter in Bethlehem. The shelter provides a place for new mothers and their babies to stay until they can afford to go out on their own. Donations will be collected this Saturday, November 3 during the volleyball tournament held at Holy Family Gym. We will be collecting new items such as diapers, baby wipes, baby formula, baby books, bottles, baby wash and lotion, shampoo and conditioner, soap, deodorant, laundry detergent, blankets and pillows, toilet paper, tissues, paper towels, and socks. We will also be collecting monetary donations. If you can support our service project, then please drop off donations in the gym from 8 a.m. until 3 pm. on Saturday, Your support is greatly appreciated. Check out the newest edition of the school newspaper - The Call of the Faith! It's their seventh edition and it's loaded with tons of information written by our students about our students and school. Read all about the upcoming gala! Or see who's new in Coding Club and Mad Science. Read about the eighth-grade graduation and the cross country team. There are also tons of cute pictures from the Blessing of the Animals. The link to the newspaper is in Student Life, The Call of the Faithful. Holy Family School held a very special Dress Down Day on Oct. 18 – the Missionary Childhood Association. Kindergarten through eighth-grade students formed a huge Mission Rosary on Oct. 18 in the Holy Family School gym. The raised more than $200 for the Missionary Childhood Association. Founded in 1843, the Missionary Childhood Association raises money through schools and directs the funds toward self-help programs for children around the world. They call it “children helping children.” The money helps the people in poor areas build schools, provide medications and health and nutrition programs, pay school fees, and provide teaching and learning resources. The students at Holy Family School raised more than $200. They also wore special colors according to their grade in order to raise awareness of Mission Sunday on Oct. 21 and to draw attention to the needs of many children around the world. World Mission Sunday is an event of the Pontifical Mission Societies in the United States. Students in Kindergarten and first-grade wore red in honor of Africa. Second- and third-graders wore yellow for Asia; fourth- and fifth-graders wore white for Europe; sixth- and seventh-graders wore green for North America, and the eighth-graders wore blue for the Pacific Islands. he Missions and life in each continent during their religion classes. At the end of the day, the whole school came together in the gymnasium to form a huge Mission Rosary. Students held up signs representing their region, while other students formed the cross at the beginning of the rosary. The project was organized by eighth-graders Clare Duffy and Sophia Ronca, who are also student mission representatives for Holy Family School. Their advisor is fourth-grade teacher Mrs. MaryAnne Cummings. The Home and School Association would like to thank everyone for their support of our 2nd Annual Trunk or Treat! Just when we thought that last year's creativity couldn't be topped, everyone outdid themselves! The trunks and costumes looked amazing! These events cannot be successful without a high level of participation! We had 30 decorated trunks and 190 Trunk-or-Treaters! So, a huge thank you again for your participation! Holy Family School's alumni are racking up some great accomplishments, and they’re still in high school. Take a look. Abigail Wachter was chosen to be a member of the Notre Dame High School Homecoming court. The school held Homecoming on Oct. 12. Her brother Michael is in the fifth grade at our school. Abigail also participated in Soccer Senior Night on Oct. 15. She wears number 6 for the girls’ soccer team. Several alumni were inducted into the national Honor Society at Notre Dame High School on Oct. 17. These students include: Olivia Shollenberger, Elizabeth Mattair, Connor Duffy, Victoria Dyer and Isabella Goffredo. On Oct. 4, it was announced that BECAHI tennis star Brenna Magliochetti is heading to State’s. Way to go! Then on Oct. 12, she was crowned Homecoming Queen. What a month! Keith Neidig was chosen as the Student of the Week for the week of Oct. 15-19. Brian Friess, number 35, was recognized on October 15 during Bethlehem Catholic’s Soccer Senior Night. Holy Family School has some of the greatest parents. Here is a beautiful letter from one of them. that was sent to us in August. It is hard to believe that we are starting school tomorrow. I just wanted to let you know what a positive experience Holy Family School has been for our family. Leah is starting high school at Notre Dame. Based on her placement test, she was put in honors math, science and history. I really appreciate all the tutoring help last summer from Mrs. Guarino in math and her teachers last year. Claire is excited to start seventh grade. She really flourished with her wonderful teachers, positive environment, and small class sizes. She loved the extra special things too like the dances, Trunk or Treat, class trip to see a play, and the science fair that help make Holy Family School special. We are excited for another good year. Thanks for all you do for our students and kids. They say it takes a village to raise a child and you are a blessing to our school and families. From left to right, eighth-grade students Sophia Albanese, Amber Unger and Gabriella Lagomarsino develop and test their hypothesis in class about crystallization. Holy Family School’s eighth-grade science teacher Deb DeNardo had her students explore crystallization via a hands-on experiment. “We were working in our desk groups to form a hypothesis of how we think magnesium sulfate crystals form,” said Amber Unger, an eighth-grade student at HFS. Sophia Albanese developed their hypothesis DeNardo told them and all of the student groups to put their ideas to the test. The results of this experiment will take a little while to see, but as the days pass the students will see crystals of different colors form along the fibers of pipe cleaner. DeNardo said the pipe cleaner gives the crystals a structure to form around so that they students can easily pick it up and look more closely at the crystals. It's that time of year to sign-up for CYO Basketball. Don't make dinner on Tuesday night! Go to Chipotle and earn money for the school. From your order, 33 percent will come back to the school! Wow! If you haven't signed-up yet for the Respect Life Club, please do so here! Volunteers are needed Oct. 19-22 for the Scholastic Book Fair! Do I hear Angel Point opportunity? Yep! In addition to the in-school positions, there are several options to do at home prior to the fair to help get ready! Additional positions will be posted as they become available. Sign up at Book Fair. Parents will need to create a Scholastic account in order to sign up. By signing up, you will have access to extra information regarding the fair and the new e-wallet, which will allow parents to set a spending limit online and not have to send cash to the school! Look for more info closer to the fair regarding the e-wallet! Please email bookfairhfs@gmail.com if you are interested in volunteering and are unable to set up a Scholastic account. The Nazareth Area Golf Team Booster Club would like to invite all the Holy Family Athletes and friends to participate in this year’s Fall Junior Golf Clinic at Southmoore Golf Course on Saturday, September 22, 2018. Please visit Golf Clinic to download registration form or see attachments for more information. CYO Soccer sign-ups are open now through Sept. 7. Please go to Soccer sign-up to register. The CYO Soccer program is held jointly with the CYO program at Sacred Heart Church in Bath. Please also review and complete these additional CYO forms. Coaches are always needed. Please contact the Holy Family Athletic Association Secretary at hfaasecretary1@gmail.com for more information. You can earn Angel Points for coaching. Every month, Volunteer Angel Point opportunities will be listed here. It doesn't take too long to get the 20 hours in, so check back often or go to the Home and School Association's new website for more information. It can be accessed from our website under the For Parents tab. BOOK FAIR co-chairperson - 20 Angel points awarded for position. The 2018 Fall Scholastic Book Fair is coming to Holy Family School Oct. 22-26. We are seeking volunteers to help make this year a success! Please consider donating a few hours of your time to share the love of reading with our students! Sign up at Book Fair 2018. Please remember all clearances are needed for in-school volunteers. We are still looking for a Co-Chair to assist with the Book Fair. The selected Co-Chair will assist with all the "behind the scenes" work to ensure the fairs are successful and work at the fairs during all open hours, including set-up and break-down. All 20 VAP points are awarded for this position. A co-chair will also be responsible to assist with the Spring Fair. Please email Joyce Schuster at bookfairhfs@gmail.com or Jean Mazzarese at chaircoHFHSA@gmail.com if you are interested. PLAYGROUND COMMITTEE - this group of parents will work with the Facilities Committee, a committee of the School Board, to do things related to the playground, such as help spread mulch on a Saturday afternoon. This can qualify for "in school" points. Contact Kris Porter at 610-759-5642 ext. 118 if interested. Nazareth Farmers Market - Saturday, Sept. 22, 9 a.m. - 1 p.m. in the Nazareth square. Call Mrs. Porter at 610-759-5642 ext. 118, if you can help. She is also accepting donations that can be used for prizes, such as little bags of pretzels, cookies, or small give-away toys or stuffed animals. You can get Angel Points for donations, too. And please come visit her at the events. Every month, Volunteer Angel Point opportunities will also be listed in the News and Events portion of the school website. It doesn't take too long to get the 20 hours in, so check back often or go to the Home and School Association's new website for more information. Holy Family School has some of the best parents in the world! Thank you to our parents, Mrs. Michele Hoole, for picking up Rita's for all of our students and staff on Thursday, Aug. 30, and Mrs. Ivette Andino-Rodriguez and Mr. James Chase for helping her to spoon out the treat. The blue raspberry was gobbled up the quickest, but we loved the lemon and cherry, too. Refreshing! Seventh-grade social studies teacher Mary Lynn Barner attended a conference in Virginia thi s summer and the Washington Post wrote an article about it. The conference was held at the Stratford Hall Teacher's Institute. The Institute focused on the different debates inspired by slavery during the Early Republic period. Miss Barner also attended last year and says it has provided new information and insights about the Transatlantic Slave Trade she will use in her classroom. Click here to read the story. The Holy Family School playground needed more mulch to provide a soft cushy surface for the children, so Facilities Committee Chairman Mike Porter calculated how much was needed, placed the order with Green Pond Nursery and had it delivered Friday, Aug. 24. With the help of 11 parents, the crew spread out about 80 yards of mulch in the playground and preschool play areas, and were done before noon on Saturday. "I'm really glad they showed up," Porter said. "They made the work go a whole lot quicker." The entire playground has at least another six inches on mulch on it. Porter also added a taped line to the equipment so the staff know when it's getting a little low. Check it out! The Allentown Diocese just released it's newest promotional video, and Holy Family School has some of our students in it. Take a look and see if you recognize them. It's on our Facebook page. Check out the school's newspaper "The Call of the Faith"
The newest edition of the Holy Family School newspaper "The Call of the Faith" is available on our school website. Check it out. Just click here The Call of the Faith. Our sixth edition is full of great stories written by our students. See what Nicholas Isaac has to say about the Race for Education or Emily Dalton's account of her First Communion. Then there are the interviews. Victor Joseph interviewed Mrs. Vosseller. Did you know she speaks five languages? No? Read all about it in this issue. Volleyball registration - Good news, CYO has officially approved a 4th-grade girls volleyball program. Registration continues for 4th - 8th grades, too. Please visit www.holyfamilyathletics.org to download, complete and e-mail all forms posted for registration and send them in ASAP to nazholyfamilyvolleyball@gmail.com. New kick-off date will be Aug. 1 @ 5:30 p.m. in HF gym. Free Volleyball Clinic - Attention 4th and 5th grade girls from HF School and PREP. Join us for this great opportunity for a free "Introduction to Volleyball" clinic. Bump, Set and Spike to learn all about the exciting sport of volleyball from the coaching staff of Notre Dame High School. Please join us on July 30 & 31 from 4:30 - 6:30 p.m. in HF gym. Spread the word to all parishioners and RSVP to nazholyfamilyvolleyball@gmail.com. Cross Country - Last call to sign-up for CC is July 30th . Visit www.holyfamilyathletics.org for all required registration forms or get them on the school website under Student Life/CYO Atholetic Association, and e-mail them to holyfamilycrosscountry@gmail.com. Click to read all about the Cross Country. Holy Family Church's annual festival will open Thursday, July 26 with Ethnic Night from 5 to 9 p.m. The menu includes bratwurst and sauerkraut, kielbasa, pierogies, cabbage and noodles, meatball sandwiches, roast beef sandwiches, pizza and even ethnic drinks such as German beer, German Riesling wine and Italian Valpolicella wine. Rides will be open to preview, too. The festival goes into full swing Friday from 5 to 11 p.m. with great festival food such as funnel cakes but also some specialties like clams and rib-eye steak sandwiches. Saturday is "Ride Night" with a special price of $15 to ride from 6 to 10 p.m. Festival is open from 5 to 11 p.m.
Love music? On Friday night, Fresch will perform; then "The Kickbacks" take the stage on Saturday. Come Sunday, “Joe Kroboth” will open the festival and perform from 4 to 7 p.m. followed by the “Jealous Monks” from 7 to 10 p.m. Festival closes at 10. The Helping Hands Club will hold its ninth annual Back-to-School Clothing Sale from 9 to 11 a.m. on Saturday, July 14 in the Holy Family School gymnasium. The affordable summer and back to school clothing is gently used, and help to make going back to school a little easier for some families in the community. There are no set prices, but the club does accept donations which will be donate to the parish SOS fund to help other families in need. New and gently used clothing donations for infants, children, and teens will be accepted at all Masses on July 7-8. Parish youth (6th grade & up) are needed to help with set up on Friday, July 13 from 6 to 8 p.m. Clothing donations will continue to be accepted at that time. Holy Family School's Academic Bowl had a winning season this year and went on to the District Competion at Notre Dame Elementary in Bethlehem in late April. The team won the district match against St. Ann's of Bethlehem 385-315 for the championship. For anyone not familiar with Academic Bowl, it is a competition that tests the knowledge of eighth-graders on a variety of academic subjects - not trivia. Our Academic Bowl team went nearly undefeated this season with only one loss of 10 points against Our Lady of Perpetual Help in the final match before Districts. If a regional competition had been available against other districts in the diocese, then Holy Family School's team was ready for it. "They were very disappointed," said Miss DeNardo, one of the team's coaches. In addition to Miss DeNardo, the team was also coached by Miss Barner. Holy Family School alumnus Jonathan Boucher has plans for the unused girls' locker room at the school. He wants to convert it into two large storage closets that will hold art and school supplies. It's all part of his Eagle Scout Project. Boucher is a Life Scout member of Troop 74. In order to complete his Eagle Scout project, he needs raise money for supplies, so he created a Go Fund Me page at https://www.gofundme.com/holy-family-shower-conversion. The money will be used to purchase materiials to construct walls, shelving and locking doors. His goal is to raise $1,200 and so far he is at $230. If you can help, please go to his page listed above and donate. There is so much to share, so Mrs. Porter launched a new page on the school website for blogging. It's in the tab "About Us." She plans to add a new "Porter's Points to Ponder" periodically, probably every couple months. Take a peek. She tackles tuition in the first blog. 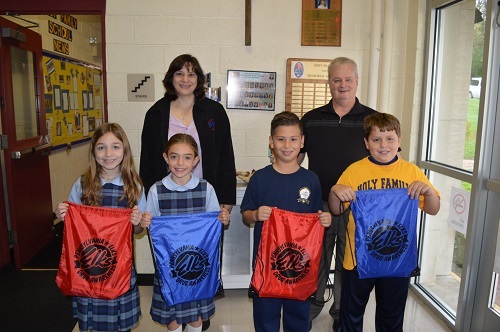 Holy Family School school students had an opportunity to learn how to save another person's life by using CPR. Our school nurse, Mrs. Banghart, was instrumental in making the training possible. "We had Mr. Rothrock from Rothrock’s EMS Training do the training,” Banghart said. “He is a parishioner at Sacred Heart Church in Bath. He also is responsible for the staff CPR training." The seventh- and eighth-grade students received the training in early May in our school gymnasium. Banghart holes that it will become a regular program at the school. 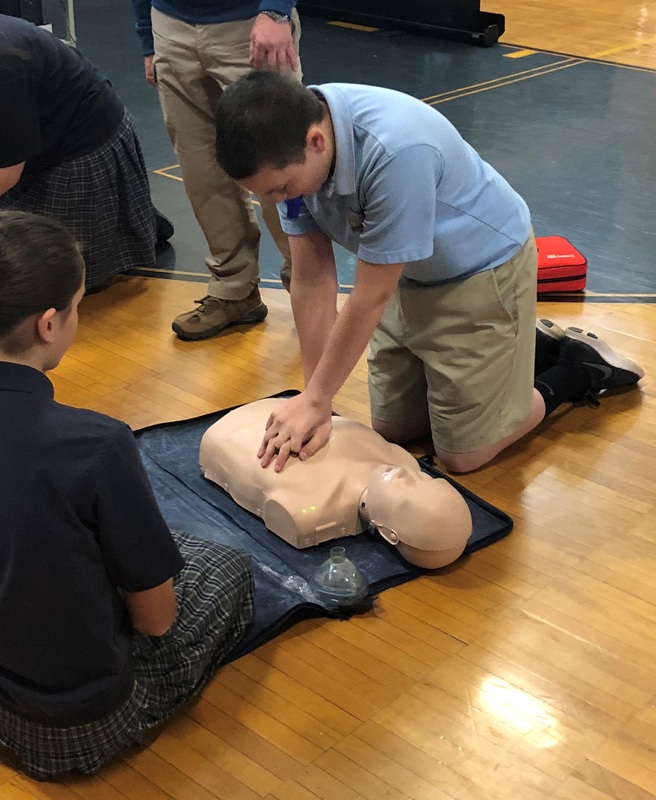 "From here on out, my hope and plan is to incorporate CPR classes into the seventh-grade health curriculum," she said. The CPR training was made possible through the Traumbower Grant, which Banghart applies for every year. Check out more pictures from the training on our Facebook page. Experience a roller coaster of emotions when the Holy Family School’s Drama Club presents “Inside Out” this weekend on stage in the gymnasium. “It is a very entertaining ride through Riley's brain through her emotions,” said production assistant Florinda Meli. The program is a musical version of the Pixar movie, Meli said. She loves the show and has her favorite parts, but the public has to come out and see it for themselves to pick their favorite part. The cast consists of: Brittany Nestor as Riley, Katherine Dalessio as Joy, Aidan Foley as Anger, David Stangl as Fear, both Henry Grimm and Tess Gunning will play the role of Sadness, and Gianna Caiazzo and Haidyn Searls will share the role of Disgust. Alivea Jones will portray the Mother; Parkin Corley, the Father; Kayleigh Lauten, Riley #2; and Callie Searls as Little Riley. The fourth-to-eighth-grade ensemble includes: John Baron, Parker Chase, Ella Corley, Gina Favocci, Eva Giordano, Julia Goffredo, Sophia Hahn, Abigail Halldorson, Morgan Halldorson, Michael Hurd, Nicholas Isaac, Brian Laurito, Meara Mason, Madilyn McLouth, Haley Nedo, Molly Neidig, Brooke Scalley, Amber Unger, Elizabeth Wikris and Charlie Wyke, as well as members of the cast with speaking parts. And the first-to-third-grade ensemble cast includes: Vanessa Chase, Kristen Dalessio, Nina Dang, Cindy Favocci, Kayla Fiore, Piper Lerch, Lena Honnen, Angelina McDaniel, Sydney Mihalik, Sophia Reszek, Brayden Rizzotto, Isabella Vergara, Myla Wheeler, Leah Zachariah and Kassie Zin. The ensemble will perform in various singing and dancing groups, such as the Lava Dancers, Dream to Nightmare Dancers and Guilty Conscience Dancers. Auditions were held in January, and the fourth through eighth grades have been practicing three times a week and every Sunday for the last couple months. The children in first through third grades joined the practices in late March on Sundays. Show times are 7 p.m. Friday, 3 and 7 p.m. Saturday and 3 p.m. Sunday. Tickets are available at the door or at the Holy Family Parish office at 23 Forest Dr., Nazareth during regular business hours. General admission is $8. Tickets may be used at any performance. The gymnasium is handicap accessible. 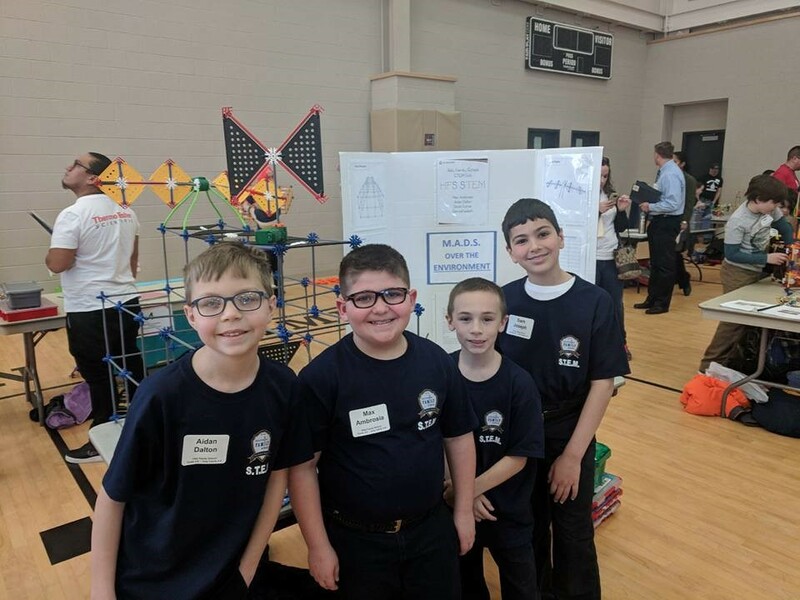 Holy Family School's STEM Club team came very close to placing at the competition on March 23 at Northampton Community College's Monroe Campus against 70 other teams. This was their third year in competition. Although they didn't place in the top three, they came in just under that. The club's advisor Mr. McMaster said the schools after the top three are not ranked, but their score was high enough for them to come in around fourth. The sixth- to eighth-grade group created a new type of microwave and the fourth- to fifth-grade created a way to power your home using the wind, McMaster explained. "Overall, it was a great experience for them to compete at the college against 70 other teams," he said. "I'm really looking forward to competing again next year and hopefully bringing back a winning medal." For this year's challenge, Thermo Fisher Scientific wants the teams to develop a new product for use in houses. The product could be anything that can be used in a house but it must be environmentally friendly, because the company strives to create products that make the world healthier, cleaner and safer. Some examples of possible new products a new appliance, a new way to power the house, or a new gadget. The product had to be built out of K'NEX toys. The teams use a blueprint to design and build the required object for this year's challenge. At the competition, they also will present a report, submit their blueprints and cost sheets, and build the object within a certain time limit. Team member and seventh-grader Amber Unger said she competed in STEM for the last two years and found it to be amazing. She said she has had a great time learning about the competition and what is expected. "This year, I knew we had to come with a unique idea, because many people at the competition are very serious about winning," she said. "We did a great job improving all aspects of our invention." Unger said the most important thing she learned this year was that the journal should have entries from every meeting. That is where our team lost points, McMaster explained. "I believe our whole team comprised of Cara Magliochetti, David Stangl, Molly Neideg and myself did an amazing job this year. I am so excited for next year to roll around," Unger said. "I would really like for Holy Family to take home a medal next year." Our team was comprised of Max Ambrosia, Aidan Dalton, Derek Fulmer, Sam Joseph, Cara Magliochetti, Molly Neidig, David Stangl and Amber Unger. It is led by our computer teacher Mr. McMaster with assistance from parent volunteers. Max Ambrosia, Aidan Dalton, Derek Fulmer and Sam Joseph competed in the 4th-5th-grade Division. Cara Magliochetti, Molly Neidig, David Stangl and Amber Unger competed in the 6th-8th grade division. We have made more than $25,000 and you can still help us reach the $30,000 mark. Donations are being accepted throughout May. Donations are tax deductible! Just click on the link below to donate at www.race4ed.com/hfsn. For every $50 donated, a sneaker is placed on the wall with the donor's name and the student's name who raced. The children love to see their names on the wall. Please considdere adding to it.Thank you! Promotion is from 4 to 8 p.m. May 16. The sixth-grade English literature class recently took up tasting books. Not literally. No, they were just gaining the essence of a book by reading the first few pages before quickly moving on to the next one. The Book Tasting is a cross-curricular activity, she said. The students research an author in the library for her class. In computer class, they will create a bi-fold pamphlet or Power Point presentation about the book or author for Mr. McMaster. And for Mrs. Kaczor, they will write a research paper and implement citation skills. The activity encourages the students to step out of their typical comfort reading, and explore a palate of different genres. Our budding journalists created a fantastic edition of Holy Family School's "The Call of the Faith." Check it out. This edition provides full coverage of the events from Catholic Schools Week, plus interviews and sports. If you didn't make it to FreeFall, then read all about it and see some pictures from the night. Holy Family School filled FreeFall, because we had it all to ourselves. Then during the school week, the students enjoyed a multitude of assemblies including WFMZ meteorologist Dan Skeldon, science assemblies with DaVinci Science Center and Mad Science, Wacky Olympics, the Talent Show, Religion Bee and an anti-bullying assembly by BMX Action Sports. It doesn't stop there, we also had a 7th vs. 8th grade basketball game and a volleyball game between teachers and parents vs. the 8th grade. Tons of fun. There is so much to read and see, check it out. Just click on Student Life, then Call of the Faith. Click on the 5th Edition link. Enjoy! Holy Family School alumna Gracie Kindt took the stage in early April at Nazareth Area High School in the lead of its spring musical “Little Women” with two weeks of performances. Although Kindt has the lead, she is accompanied on stage by fellow Holy Family School alumni Maura Muretta, Dominic Philip, Robin Lerch, Rachel Kindt and Julia Hockenberry. Kindt, a senior at NASD, performs the part of Jo March, a young, outspoken woman who is brave, loyal and has a prolific imagination similar to that of her creator Louisa Mae Alcott. The musical is based on the book by the author. Kindt is no newbie to the theater. She began performing in second grade with the Holy Family Players in the school’s Drama Club. By sixth grade, she played the lead character Oliver Twist in the school’s production of “Oliver.” The following year, she took the lead as Cinderella in the school’s production of the same name. “Oliver was definitely my favorite,” she said. Kindt said the being able to enter theater at a young age has really helped her as an actor now. Little has been the director since 2004, and some of her students have gone on to win Freddy Awards. She doesn’t plan to major in theater, but instead political science when she goes to the University of Pittsburgh in the fall. “I definitely hope someday I can do some community theater,” she said. “Little Women” will open at 7 p.m. Thursday with shows again at 7 p.m. Friday and Saturday evening, and a matinee at 2 p.m. on Saturday at Nazareth Area High School. The musical will again be presented at those same times the following week on April 12, 13 and 14. Holy Family School will present “Inside Out” at 7 p.m. May 18, then 3 and 7 p.m. May 19, and 3 p.m. May 20 in the gymnasium. Mind moving pizza Friday to Sunday? Chipolte was a huge success! Thank you to everyone who ate there on Monday. HSA received $854 that will benefit the students at our school. If you want to eat out again, maybe move pizza Friday to Sunday and join us at MOD PIZZA on April 22 - anytime during the day. MOD Pizza is at 4763 Freemansburg Ave. in Easton. Just bring in this flyer, show it on your phone, or just tell the cashier you are supporting Holy Family School. MOD will donate 20% of your bill to support our school. See you there! And thank you so much! Holy Family School's Chipotle fundraiser is April 16 from 4-8 p.m. at the Freemansburg Avenue location. Please make sure you mention our school, show your smartphone or present a flyer. If you do, then Holy Family School will earn 50 percent of the proceeds! The parish office has limited $10 Chipotle Gift Cards to order! Order yours today or order the day of the event with ScripNow and earn 10 percent toward your rebate goal. Notre Dame High School in Easton will offer a one-day youth football camp from 9 a.m. to 2 p.m. Thursday, July 19. The camp is for children who are five years old to eighth grade. The cost is $60 for the first child, $40 for the second child and the third or more are free. Click here for the football registration form. The high school also has camps for basketball, volleyball and soccer. Click this link for more information about the additional camps. The Paschal Triduum is here. View the Paschal Triduum Schedule for Holy Thursday Mass and programs. If you haven't gone to Triduum, now is the time to come. Maybe you haven't seen the feet washing at Holy Thursday Mass. Come, then stay and visit with Jesus at Eucharistic Adoration. 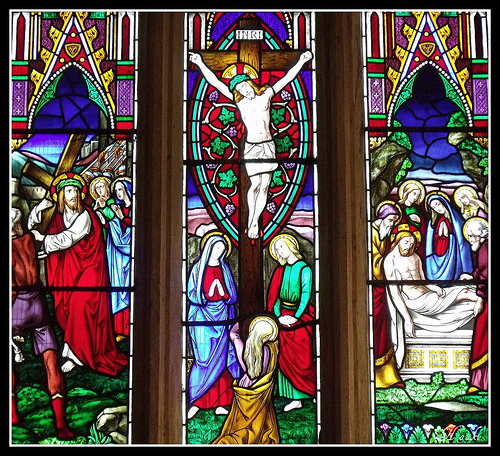 On Friday, stop by for veneration at 3 p.m., then come back for Stations of the Cross at 7 p.m. Walk the path Jesus walked. Then on the evening of Holy Saturday, come to Mass at 8 p.m. and experience as the light of Christ is brought in and the flame of the Paschal Candle is shared to others. Some of the adults who have been studying to become full members of the Catholic church will be baptised; all will receive their First Communion and be Confirmed. Come and welcome them into our Catholic community. At home with the children, turn the palm fronds into Palm Crosses and bake some Easter cookies with a special surprise inside. Coloring Easter eggs is just one part of our Easter tradaitions. Holy Family School is the first Catholic pre-Kindergarten through eighth grade school in the Allentown Diocese to lauch online enrollment. Now, families who would like to learn more about our school can click on Online Inquiry under the Admissions tab to gain more information. They can also click on Online Inquiry under Admissions, Tours and Shadow Days to schedule a tour of the school or set up a day for their children to shadow in the classroom. Want to attend Holy Family School? Under Admissions, just click on Online Application. This is the first step for new families who would like to enroll their children in Holy Family School. Once we receive the application and have reviewed your child's school transcripts, then we will contact you to know if he or she is accepted for admission. Registration is completed with the Online Enrollment. When it comes time to re-enroll, parents use Online Enrollment through RenWeb's ParentWeb to complete the enrollment for the following school year. Our Holy Family School students came through with flying colors! They raised $1,106.79 in the Coin Challenge during Catholic Schools Week for the children at Colegio La Piedad – a school in Isla Verde, Puerto Rico. Mrs. Scheirer’s fifth-grade class raised the most with $334.54. They placed in the top three consistently throughout the week receiving gold balloons for first place and blue balloons for thrid place. Silver balloons were for second place. The class will celebrate with a pizza party after Lent. Mrs. Scheirer's fifth-grade class donated $334.54 to the Coin Challenge to rais money for Colegio La Piedad. Second and third place were close with Mrs. Vadala’s third-grade class coming in second with $141.20, and Mrs. Christ’s first-grade class with $133.15. Fourth place was Mrs. Liberatore’s second-grade class with $118.24. And fifth place was Ms. DeNardo’s eighth-grade class with $99.31. Thank you to all of the children for donating their coins. Every penny helps, because together they can make a difference. Just like people. Together, we are able to help another school. But wait! The good news doesn’t stop there. Parishioners at Holy Family Church and friends of the school have also chipped in to help Colegio La Piedad. To date, they have donated $1,031, and more donations are still coming. Thank you for your generosity. The grand total at this point is $2,587.79, which is comprised of donations from the parishioners and friends, Coin Challenge and the $450 raised by the Holy Family School Student Council’s Peppermint Postcards in December. Again, thank you for your generosity. Although Colegio la Piedad sustained damages amounting to more than $10,000, our donation to them will help to make a difference, and will let them know they are cared about by people more than 1,600 miles away. In addition to encouraging philanthropic activity, our students will have an opportunity to correspond with their students and learn about each other’s lives. What a wonderful way to grow. Notre Dame High School in Easton has announced its scholarship offerings for Incoming Freshman for the 2018-2019 school year. If you would like to learn more about their scholarships and financial aid, then please click on this link. Additional information about the high school can be found by contacting, Nancy Ann Caroprese, Director of Development for Notre Dame High School at 610-868-1431, Ext. 123, and Philip Stambaugh, head coach for Notre Dame High School. Holy Family School kicked off Catholic Schools Week with an Open House from 10 a.m. to 1 p.m. on Sunday, Jan. 28. As families entered through the gymnasium doors and walked through the balloon archway, they were warmly greeted by Holy Family School staff, students and parents. The Open House was held to give new families an opportunity to see what we are all about, and our current families an opporunity to meet with their children's teachers next year. Families were able to talk with members of our Homome and Family Association, Technology Committee, and earn more about school clubs. It also gave people an opportunity to meet members of Holy Family Church's parish organizations and parish-related organizations, such as the Pro-Life Committee, Handbell Choir, Knights of Columbus and Nazareth Food Bank, whose president is a parishioner. For anyone who missed the Open House bubt would like to learn more about our school, a private toour is always available. Just call the school at 610-759-5642, ext. 118. Registrations for next year are being accepted. Nearly every student at Holy Family School came out to bounce at Freefall Trampoline Park on Jan. 28. It was one of the largest crowds the school has seen, and a good thing, too, because the entire park was reserved for just our students and their friends. The trampoline park on Baglyos Circle in Bethlehem was closed to the public at 7 p.m., but Holy Family School students kept bouncing until 8:30 p.m. There was much to do from dodge ball on trampolines, trampoline runs, trampoline basketball, a bucking bull, and so much more. The event was held as a fun activity to premiere a week of fun assemblies during Catholic Schools Week. 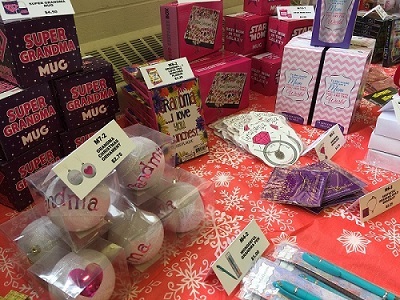 In addition to planning the event at the park, the Home and School Association also held a Silent Auction full of donations from local businesses. Everything from gift cards to restaurants to travel coffee mugs were available. Parents of children in seventh grade who will be receiving the Sacrament of Confirmation at Holy Family Church in the fall are required to attend a meeting at 6:30 p.m. Jan. 25 in the church. Please click on the document below for more information. The meeting was reschedued from the original date of Jan. 4 due to inclement weather. Two school counselors from Colonial Intermediate Unit 20 will be talking to our students in Kindergarten through eighth grade about how to prepare for future careers. The program has been rescheduled for Jan. 19 at 9:30 a.m. Please see the flier to learn all about the program. Seventh Grade performs "A Christmas Carol"
Ms. Kaczor’s seventh-grade class performed the Charles Dicken classic “A Christmas Carol” for the sixth graders on Thursday. The story is part of their curriculum. “Much of how we celebrate Christmas has resulted from this piece of literature,” she said. And another byproduct of acting out the play for an audience, is that it gives students who have never had an opportunity to act to experience acting. The Holy Family School Junior Band, Advanced Band and violinists performed a variety of Christmas favorites Monday night in the school gym. Their teacher, Mrs. Marianne Forkin, served as the director. The violinists are Gina Favocci, Sarah Hock, Nicholas Isaac, Michael Wachter and Elizabeth Wikris. The Junior Band members are Phillip Ronca and Landon Sterner, both on saxophone; Michael Hurd and Nathaniel Kochenash, both on trumpet; Eva Giordano on bells; and Emmalee Arvelo on drum. And the Advanced Band members are Cara Magliochetti, Sophia Ronca and Amber Unger, all on flute; Vanessa Amrick, Meara Mason, Madilyn McLouth and Rhia Pammer, all on clarinet; Henry Grimm and Christopher Horvath, both on saxophone; Brian Kruzcek on trumpet; and Parkin Corley, Dylan Ephault, Matthew Lufburrow and Derek Perkins, all on percussion. Miss Barner, one of our seventh-grade teachers, was featured in a sports article in the Times News. When not in class, Miss Barner loves working out in the gym as a power lifter. She also competes, and is determined to reach the elite level. Learn all about her love of the sport in the article below. Our very own Makayla Hoole, of Easton and a first-grader in Mrs. Christ's class, had the opportunity of a lifetime. She danced with the Moscow Ballet on Sunday during their performance of the Great Russian Nutcracker at the State Theatre in Easton. She was a snowflake. Her story was also noticed by the local media. Check it out. Hoole is a member of the impact competition team at Dance Design Studio in Easton, and was selected for the performance following an audition. Her mother, Michele Hoole, said the Moscow Ballet touring company holds auditions at each stop to allow local youth between the ages of 6 to 18 to participate. This was Makayla's first time dancing with professionals, but she has danced in competition several times. Leading up to the performance day, Makayla said she was very nervous. She didn’t get to practice with the Moscow Ballet until the morning of the performance, when they did the final run through, her mother said. “I want her to reach for the stars. To do whatever she wants and to know that her family, her friends and even her school is behind her in achieving any dream she wants,” her mother said. It's our annual drive for homemade ornaments for the Christmas trees at the school. They can be made from a kit, have the student's picture in it or "made from scratch." Ornaments made by the Kindergarten through second grade will be on the tree in the entrance of the school. And ornaments made by the third grade through eighth grade will be upstairs on the tree by the big window. Mrs. Bruce said the younger students love to make ornaments, but every year the tree upstairs is a little scant. There's the challenge. We need those older students to step up and make just as many ornaments, too. Student shoppers have begun to peruse the wares at the Santa Shop looking for that perfect gift. This event gives the children a chance to share the Christmas spirit of giving to others and shop for the people they love. Items are priced from 25 cents to $12.50 and are beautiful. Any family member would love them. Here is the schedule of when the children will be shopping. Tuesday - 5A-9:15 a.m., 3B-10 a.m., 8 Algebra-10:45 a.m., 3A-1:45 p.m.
Wednesday - 6A-9:15 a.m., 2A-10 a.m., 8 Pre-Algebra- 10:45 a.m., 6B-1:45 p.m.
Thursday will be for anyone who is absent when his or her class goes to shop. We will need volunteers to set up, help the children purchase items, and clean up from the shop. This is a great way to earn your volunteer angel points! Class visit times are listed if you want to help your little shopper. Thank you and Merry Christmas! Make this blank T-shirt your canvas. The deadline for entering the Spirit Wear T-Shirt Design Contest has been extended. The new deadline is Dec. 14, so if you have an idea go for it! The top five designs will be up for vote by the student body, and the winner will be announced during Catholic Schools Week. All proceeds from the sale of the T-shirts will benefit the school. This is the Home and School Association first time running the Spirit Wear T-shirt Design Contest, so show your school pride and put it in a design. 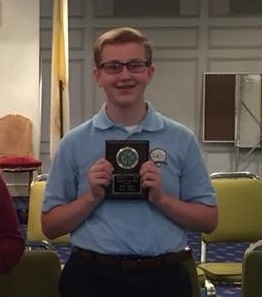 Holy Family School eighth-grader David Banko, of Wind Gap, took third place in the eighth grade division at the District 1 Catholic Youth Organization Spelling Bee on Nov. 1 and went on to place fifth in the Diocesan Spelling Bee on Nov. 5. The competitions were held specifically for students in sixth through eighth grades. “I wasn’t nervous,” he said. This wasn’t his first time to the bee. Banko competed last year at both the district and diocesan level. Although he took third place both years at the district level, he went up two notches at the diocesan level competition at St. Peter and Paul Church in Lehighton. Banko is one of four students from Holy Family School who attended the District 1 Spelling Bee held at St. Jane Frances de Chantal Church in Easton. 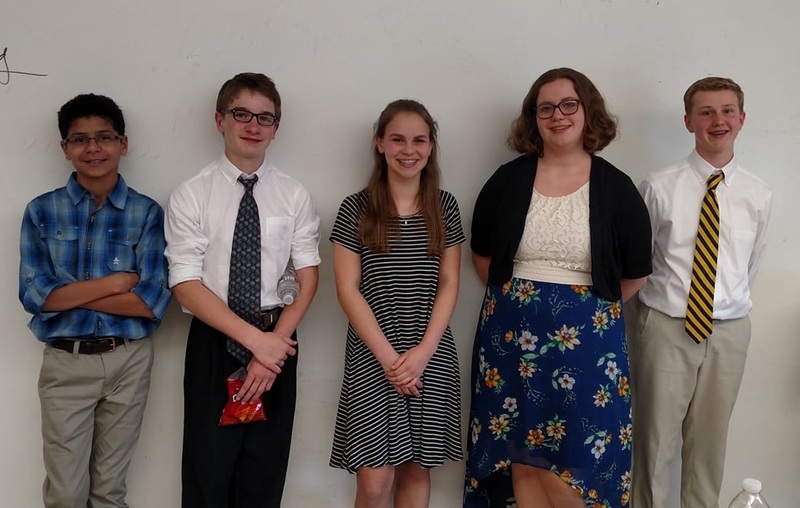 The other students include: Morgan Halldorson, eight grade, of Easton; Derek Perkins, seventh grade, of Nazareth; and Parkin Corley, sixth grade, of Easton. 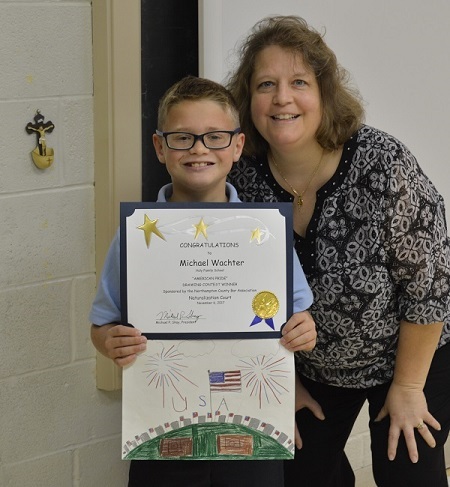 Holy Family School fourth-grader Michael Wachter won first place in the fourth-grade division of the American Pride Drawing Contest. The contest was sponsored by the American Citizenship Committee of the Northampton County Bar Association of Pennsylvania. The artwork of two winners in grades third, fourth and fifth was chosen from those submitted by art teachers in schools throughout Northampton County. Each winner received a $75 gift certificate to Barnes and Noble and an invitation to the Naturalization Court Ceremony on Monday, Nov. 6 at the courthouse in Easton. Their artwork was on display during the ceremony. Wachter’s drawing consisted of a line of gravestones on a hillside with flags beside them, fireworks were bursting in the sky and two wooden boxes were in the foreground. A large American flag stood in the center with the letters USA written beneath it. Wachter said he was inspired by the cemetery that lies between his school and the church with flags waving on the graves. “I just threw in the flags, because they were Army guys,” he said. The fireworks came about, because when he thinks about America, the Fourth of July comes to his mind. As for the wooden boxes, well, those are the bases from where the fireworks are launched, he explained. Wachter said he was glad he won. He really wanted to win that gift certificate, because he already knows what he wants to buy with it – a book about America and a Lego architecture kit of the White House. In honor of Red Ribbon Week, members of the Bangor Elks donated to the third grade students at Holy Family School red and blue bags filled with fun items for the children. Representing the classes, from left to right, are Kristen Dalessio, Callie Searls, Evan Crescenzo and Jack Levy with Elk members Kelly Neetz and John Neetz. Holy Family School lies within their region and serves students from the Bangor area. The bags included a thesaurus, Frisbee, yoyo, coloring book, pencils and a red ribbon representing the week. 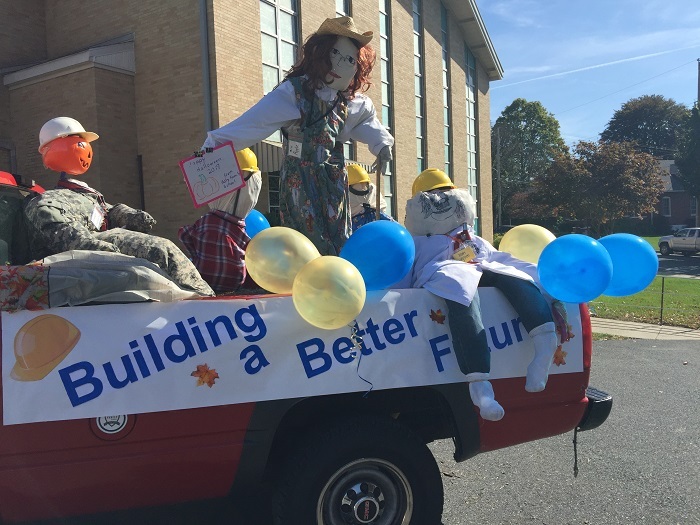 A great big “Thank You” goes out to all of the teachers and families who contributed supplies for our float for the Nazareth Halloween parade includng Mrs. Christ, Mrs. Mazzella, Mrs. Banghart and Mr. and Mrs. Rifendifer and to Palmer Nursery for donating the hay bales to secure the scarecrows. The theme was "Building a Better Future - Holy Family School" and it included scarecrows dressed as different professions. Here’s a rundown of the scarecrows. Kindergarten teachers Mrs. Bussman and Miss Vonelli and their classes put together Sgt. Kindergarten who was dressed in a military jumpsuit. Mrs. Vadala's third-grade class created Miss BooBoo who was dressed like a nurse complete with a stethoscope borrowed from Mr. and Mrs. Rifendifer. Mrs. Scheirer's fifth-grade class created a teacher named Miss Apple complete with a wrist watch, earrings and an apple pin. Thank you to Miss Hudak for lending the dress. Seventh graders from Miss. Barner's class pulled together a reporter scarecrow and named him Clark Kent. And eighth-graders in Miss DeNardo's class put together a scientist holding a microscope and wearing a lab coat borrowed from Mad Science. The after-school science program comes into the school in the fall and spring for six weeks each to work with students. The eighth graders named their scarecrow Albert Haystein. We had seven children walk in the parade with some of their parents, as well as Fr. Kaminea and Fr. Natale; Florinda Meli, parish secretary; Kristine Porter, advancement director; and parishioner Anita Paukovits. Our big red, pick-up truck was driven by Russel Ayers. Thank you Mr. Ayers! It was a warm day, and crowds of people came out for the parade – maybe more than in years past – but everyone had a great time. Our group tossed candy to the children along the way, and the children had a great time adding it to their bags of goodies. Holy Family Home and School Association’s first Trunk or Treat was a splendid success Saturday night. More than 140 children came out to trick-or-treat in a safe environment among 35 trunks decorated by family, friends and teachers, too. The decorations were incredibly varied and included everything from jungles, video games, to Star Wars and Hogwarts. The drama team from Holy Family School was so elaborate, it included a large Wizard of Oz backdrop, yellow brick road and a fog machine to add some mystery. Dorothy and her crew were there, too, and greeted all of the children. “The purpose of this event was to bring the Holy Family community together and create more school spirit,” said Margie Joseph, the vice president of the Home and School Association. Prizes were given out to three of the most outstanding trunks. 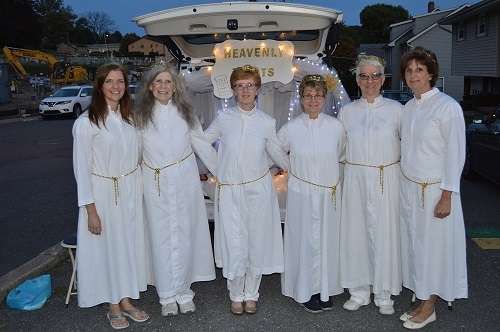 For Most Original, a group of Holy Family School teachers created the Heavenly Trunk, which consisted of an angelic scene of white lights, pearly gates and fluffy clouds full of pretzel treats. The angelic attendants were Mrs. Ecker, Miss Hudak, Mrs. Scheirer, Mrs. Guarino, Mrs. Christ and Mrs. Liberatore. The Drama Club’s Wizard of Oz trunk won for Funniest. There was much laughter at that trunk with the cast acting out their parts in an occasional chase scene. Minecraft and extended it out from the vehicle with cardboard walls, lights and decorations. The vehicle disappeared in the decorations. Concession food was available in the gym, and families had the option to pre-order pizza. Halloween-themed party music was provided by the Home and School Association. Since the event was so well-received, Joseph said they will definitely hold it again next year. Check out our gallery on Facebook at Trunk or Treat gallery. The Holy Family CYO Girls Cross Country 5-6 Division did it again. They won a second trophy. On Oct. 8, the team won the championship trophy at the Notre Dame Invitational. The girls one their first championship trophy on Sept. 17 at St. Joseph the Worker Catholic Church in Orefield. “This is an outstanding accomplishment for the girls and a great way to end our season,” said Linda Karavitch, their head coach. The girls competed against 10 other parishes in the Diocese of Allentown in the mile and a half race. Each received a gold medal for their first place finish. The cross country teams are made possible through the Holy Family Athletic Association, which also offers sports teams in basketball, volleyball, track and field. Students in Kindergarten through eighth grade may participate. The Fifth-Sixth Grade Cross Country Girls’ Team, from left to right, are: Jillian Cagno, Haidyn Searls, Kylie Karavitch, Madeline Zicarelli, Claire Martocci, Bethany Vanover. They won two championship trophies this season. Mrs. Liberatore’s second-grade class got a jump on their letter writing to soldiers overseas. They started last week and had so much fun writing and coloring their letters. The letters were written way ahead of time for Veterans Day, which isn’t until November. But the letters need to be sent weeks in advance to get there on time. Mrs. Liberatore planned to mail them to her daughter, Danielle, who works in Kurdistan, but now mail isn’t going through so easily. Quick thinking to the rescue. Mrs. Liberatore came up with an idea. She plans to scan them into her computer and email them to her daughter, then Danielle will print them and give them to the so ldiers. In honor of National Orthopedic Health Month, Dr. Brian Loftus, from Easton Orthodontics in Easton, visited the second-grade class on Tuesday, Oct. 10 at Holy Family School. This was his 15th year visiting the school and talking to the children about good dental hygiene and what to expect at a dental visit. At the age of seven or eight is when some children need spacers, retainers, expanders or braces, which means a trip to the orthodontist. Loftus said he and his assistant, Shoshanna Hinder, talk to second-graders at five other schools during the school year. In addition to his assistant, Loftus brought with him another helper, Maggie, a blue dragon with big chompers. He demonstrates for the children on Maggie’s teeth the proper way to brush and floss their teeth. Loftus also talks about cavities, what they are and how dentists care for them. He asked the children questions, and discovered this group of students not only knew the answers, but could ask some good questions. One little girl asked the doctor why sealants are only applied to the back teeth. The doctor explained it is because of the grooves in the teeth. Loftus showed the children casts of baby and adult teeth and even an x-ray. One little boy asked why they couldn’t see the brain, so the doctor explained that x-rays take the best pictures of hard material like bone. The soft tissue of the brain is hidden behind the hard bone of the skull. After the talk, each child received a packet of information about dental care and a goodie bag with a toothbrush and toothpaste. They thanked Dr. Loftus and Ms. Hinder for their visit and said they learned much. "He's the best," one little boy said out loud. Looking for something to do? There's plenty, starting with tonight. Special seating for Holy Family students who wear Holy Family attire tonight at Notre Dame High School’s football game. It’s their Homecoming Football Game. Tailgating begins at 6 p.m.
Palmer Nursery on Corriere Road in Easton (near Tatamy) is hosting its third annual Fall Fest this weekend. There will be fun, food, music, games and giveaways. And Holy Family School will be represented there, too. Come on out from 10 a.m. to 6 p.m. on Saturday or Sunday. The nursery is owned by the Honnen family. CYO Holy Family Basketball Sign-ups for Boys & Girls has been extended to Oct. 24. Log online for registration forms at http://www.holyfamilyathletics.org. Need to complete the Holy Family registration form, Diocese Medical release, Participate Pledge, Parent Pledge, Concussion and Sudden Cardiac Arrest forms. Parent participation is strongly encouraged and welcomed. From HFS, send forms to HFAA c/o Anthony Ephault. From parish, send forms to Basketball Coordinator c/o Anthony Ephault. For more information contact: Anthony Ephault, Holy Family Basketball Coordinator, at anthonyephault@gmail.com. Trunk or Treat wristbands are now on sale for this first-ever event to be held from 5:30 to 7:30 p.m. Saturday, Oct. 21 in the parking lot across from the Holy Family School gym. Each child should have a wristband, which costs $3 when pre-ordered. They are $5 the day of the event. Families who have volunteered to decorate their trunk will receive wristbands at no extra cost. Food and beverages are available in the gym, and entire pizzas can be pre-orderd at $14 each. Pizza slices will be available at the concession stand for $2 each. Print the order form, fill it out, and return to Holy Family School with payment. The Exxon Mobile United Way Team presented the Holy Family Third Grade with plaques thanking them for their work in the recent United Way’s Day of Caring project in mid-September. Teachers, Michele Kocsis and Josette Vadala, asked their students to decorate 42 paper bags for the United Way. The children used glittery stickers, Crayons, and markers to decorate the bags with rainbows, smiley faces, sunsets and heartfelt greetings. Some of the children even decorated the handles. From there, the bags were given to Meals on Wheels volunteers who filled the bags with nutritional meals, and the lunches were distributed to elderly citizens and people with disabilities in the area. The plaques from the United Way Team said the colorful lunch bags were received with “big, big smiles” by those in need. Holy Family Church in Nazareth is expanding. We're adding a Parish Center. At 12:30 p.m. on Sunday, Oct. 8, just outside of Holy Family School, the church will be hosting its official groundbreaking for a new 19,000 square foot, two-story parish center. The project is expected to cost about $3 million and should be completed by August 2018. The ceremony will take place in front of Holy Family School and will advance to the school gymnasium where the time capsule from 1908 will be opened. The capsule had been in the cornerstone of the old church. The new center will be completely handicap-accessible and will accommodate a wide range of activities. Parishioners will be welcomed into a glass-enclosed atrium lobby that accesses the elevator to the second floor. The lobby will include a coffee bar for small gatherings, such as the Hospitality Committee’s Sunday donuts. On the first floor, there will be a large banquet hall with a full-service kitchen that can be subdivided to create a smaller hall for functions such as funeral luncheons. The open space will provide ample room for large and small parish events with a total seating capacity of 244. The first floor will also include a parish meeting room, as well as a coat room and restrooms. The second floor will have a cafeteria to serve the Holy Family School students, a warming kitchen and several meeting rooms to accommodate the more than 23 parish organizations. The building was designed by the architecture firm, W2A Design Group in Allentown. Some of their work includes the Crayola Experience in Easton and the Pottstown Borough Hall. Bracy Contracting Inc., also in Allentown, has been hired to handle the construction. They are known for their work on the Levitt Pavilion at Steel Stacks, the Jaindl Building/America Bank in Allentown and the Hanover Township Administration and Public Works Facility in Allentown. Holy Family School students in grades kindergarten through fifth-grade were delighted Wednesday, Sept. 27 to see Kasey, a black Labrador retriever demonstrate the necessary skills to survive a house fire. The program lasted about 45 minutes and ended with a little diddy that Owens played on his guitar and sang for the children. The idea is to use music to help reinforce the lesson. A retired career firefighter/paramedic with more than 31 years of service in Indianapolis, Indiana, Owens said he started the program because he wanted to do something to try to prevent children from dying in a fire. “Having a working smoke detector is going to make a difference of whether you live or die,” he said. Shortly after he began doing the talks, he happened to have his dog case with him. “The kids were so mesmerized. Maybe I have something here,” he said he realized. In 1995, Kasey became an integral part of the program. Today, the Kasey Program is presented about 400 times per year and reaches more than 400,000 people. It is sponsored by Koorsen Fire and Security in Indianapolis, and is the only full-time, nationally touring fire prevention program in the country. The dogs wear the badge of the Wayne Township Fire Department in Indiana. They are trained as search and rescue dogs, and also work as therapy dogs at burn camps in Indiana, Illinois and Ohio. The children at Holy Family School in Nazareth collected money on Sept. 25 to raise money for the victims of hurricanes Harvey, Irma and Marie. The money was collected through their Dress Down Day, which was the first one this school year. Instead of the usual $1 donation and a canned food item for the local food pantry, the children were asked to donate $2 for the hurricane victims. Because the hurricanes left so much damage in their paths and so many children homeless, the school wanted to come to their aid and $650 was raised for Catholic Charities. Catholic Charities reaches out and helps people in all walks of life and situations, and the students feel blessed to be a part of this ministry. The money is now on its way to touch the lives of the needy. 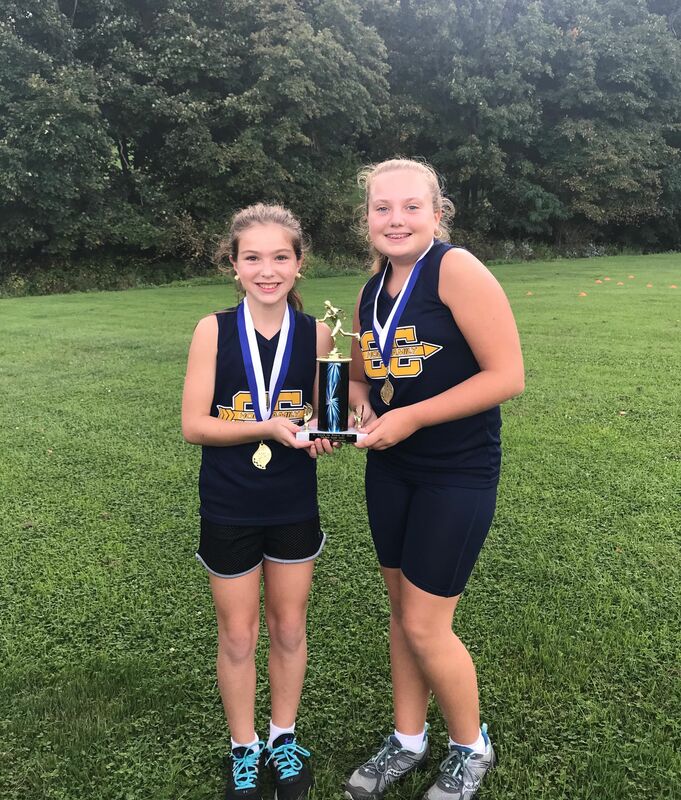 The Holy Family Cross Country Fifth and Sixth Grade Girls’ Team took home a first-place win on Sept. 16 at St. Joseph the Worker Catholic Church in Orefield. From left to right, Haidyn Searls and Claire Martocci, both students at Holy Family School, are members of the winning team. 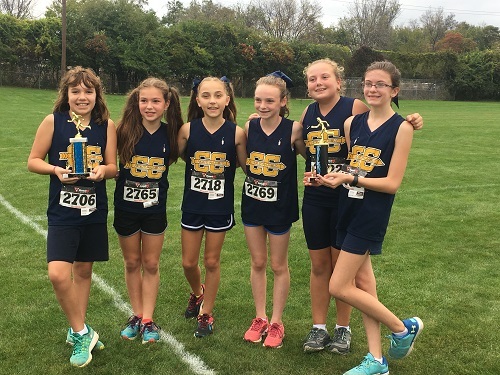 Our winning Cross Country team is comprised of six girls: Claire Martocci and Haidyn Searls, both from Holy Family School; and Jillian Cagno, Kylie Karavitch, Bethany Vanover and Maddie Zicarelli. This was the first time the fifth and sixth grade girls’ team won. The cross country teams are comprised of children who are all members of Holy Family Chruch and participate in Catholic Youth Organizations sports through the Holy Family Atholetic Association. Children in Kindergarten through eighth grade can participate. They began practices in August, went to their first meet on Labor Day weekend, and will finish the season on Oct. 13. Come Spring, registration for track and field opens. Basketball sign-ups, skills sessions and a girls’ basketball camp are all available for Holy Family School students and children who are members of Holy Family Church . Catholic Youth Organization Basketball Sign-ups for boys and girls will be held after the 9 and 11 a.m. masses on Sunday, Sept. 24 and Oct. 8 in the school gymnasium. Any Kindergarten through eighth-grade student registered at Holy Family Church is eligible to participate. The program is broken into three groups and levels: instructional, Kindergarten through second-grade; non-competitive, third and fourth grade; and competitive, fifth through eighth grade. Registration costs vary: Instructional - $50 per student or $40 with sibling in the program, one child - $80, two children - $120, three or more children - $150. To learn more about the program, check out the Athletics tab on our website or go to www.holyfamilyathletics.org to register. Then two weekends in October, Holy Family Athletics will be offering Basketball Skills Sessions led by Lehigh grad and athlete Devon Carter. He will focus on dribbling, proper shooting form, footwork, and how to practice efficiently. The first session is from 3 to 5 p.m. Oct. 7 in the school gym and is open to boys and girls in sixth through eighth grade. The second session will be from 4 to 6 p.m. in the gym for boys only in ninth through 12th grade. The cost is $20 per session. For more information or to register by Oct. 4, go to the Athletics tab. It's all there. The basketball clinic is designed for students in third through eighth grades who are enrolled at Holy Family School and other area Catholic schools. There will be two sessions: third through fifth grade from 1 to 3 p.m., and sixth through eighth grade from 4 to 6 p.m. Nov. 5 at Notre Dame HS main gym. The cost is $25. For more information, you know what to do. Got to the Athletics tab. The Holy Family School has some exciting news! Our Tennis Club has a certified tennis coach! Coach Angela Jones is the founder and head tennis coach of Angie's Junior Aces, a tennis program based out of the Winning Touch Tennis Club in Allentown. She has more than 15 years of teaching experience. While in college, Angela was the number one singles player at Saint Peters University, a Division I school. She also served as the team captain for two years. After graduation, she volunteered as the Assistant Coach for her alma mater, and was the Head Tennis Pro for the Girl Scouts of America tennis program in New Jersey for five years. Registrations are already being accepted for students in Kindergarten through eighth grade. The cost is $25. The club will meet Nov. 8, 15, 21 and 28 for students in Kindergarten to second grade and third to fifth grade. Students in sixth through eighth grade will meet Nov. 6, 13, 20 and 30. To register for the Tennis Club, go to the Activities tab under Student Life. Are you going to the Celtic Festival on Saturday or the Diocesan Family Festival on Sunday, both in Bethlehem? If you are, then please stop by the children’s tent at the Celtic Festival and the lobby at Steel Stacks on Sunday to visit the Holy Family School’s table. Mrs. Porter (the advancement director, in case you haven’t met me) will be there and would love to see all of you! I will be at the diocesan’s Catholic Schools table representing Holy Family School at the Celtic festival from 4 to 6 p.m. and Steel Stacks from 1 to 2 p.m. The Diocesan Family Festival will begin with an outdoor Multi-Cultural Mass at 11 a.m., followed by the Festival ending at 4 p.m. No Reservations needed. Just show up and bring your family or friends, and bring a lawn chair. Its parents’ night out! The Cool Our School Campaign Committee has organized a Hoedown to be held from 7 to 10 p.m., Friday, Oct. 13 at the Holy Family School gym. Silent auction for 7 to 9 p.m. Round up those boots, grab that hat and head down for some great food and square dancing. Space is limited when swinging your partner, so buy your tickets early. Tickets cost $50 each, but the funds go toward the cost to have air conditioning installed in the school. Have other plans already, but you still want to help out? Donations are always welcome. Either way, just print the order form, and return it with payment to the school in an envelope marked Hoedown, attn. 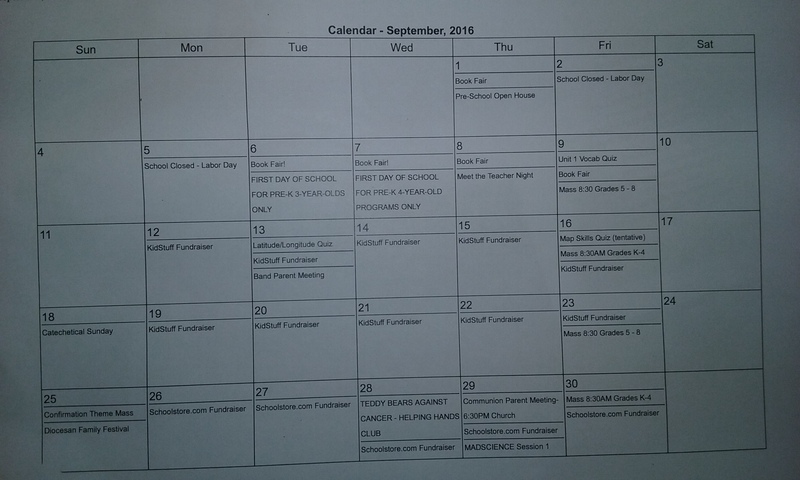 Holy Family School Special Events, and your child’s name and class. Thank you kindly for your help. Hope to see you there! Our alumni are in the news! At Bethlehem Catholic High School, Morgan Henson and Brenna Magliochetti, members of their Class of 2019, and Ellie Freiss, a member of their Class of 2020, have been recognized for their academic achievements. They are in the top 10 students in their classes. Congratulations! The Pennsylvania Catholic Conference is asking families to contact their state legislators and urge them to support expanding the funding of the Educational Improvement Tax Credit (EITC) program. Eligible businesses receive a tax credit when they contribute to a scholarship organization, educational improvement organization and/or Pre-Kindergarten Scholarship Organization. The funds then benefit needy families by providing financial assistance for both public and private, pre-kindergarten through school-aged programs. The EITC program has been acclaimed as one of the best educational programs Pennsylvania offers to students, and as is stands, the House has a chance to vote on an EITC increase. To contact your state legislators and government officials, click on the link https://www.votervoice.net/PACC/Campaigns/54365/Respond. Please urge them to support the expansion of the EITC program by voting YES on a state budget that includes the increase. Mad Science guy Mr. Bill demonstrated how forced air can push an object upward and outward during lunch today. He used a leaf blower and a roll of toilet paper. The toilet paper flying in the air put smiles on the children’s faces and laughs, giggles and squeals. The preview provided an inkling into some of what Mr. Bill plans to do in the after-school program for students in kindergarten through eighth grade. The program will run from 2:45 to 3:45 p.m. at the school for six consecutive Mondays beginning Sept. 18 and is limited to 25 children. It will cover a variety of topics including: Che-mystery, Fun-damental Forces, Fantastic Fliers, Super Structures, Under Pressure, and Wacky Water. Bill Petterson, aka Mr. Bill, owns Mad Science of Lehigh Valley with his wife Donna Petterson. Petterson said the program nurtures an interest in STEM (Science, Technology, Engineering and Mathematics). He is working on adding Art to the mix, which he fondly refers to as STEAM. “There is science in all of it,” he said. The program costs $75 per student. Registration forms need to be returned to the school by Sept. 11. For more information about the program, go to www.madscience.org/lehighvalley or call 610-438-0232. Newspaper Club- The Holy Family Newspaper Club is looking for aspiring journalists and photographers! Students will create articles related to current events at Holy Family School. Students will have fun interviewing others and writing articles to be published in The Call of the Faith, Holy Family’s online newspaper! Publications give students the opportunity not only to express themselves creatively, but also to learn the logistics of producing a distributed publication. Whether as writers or photographers, our students will learn to rise to the challenge crafting interesting, respectable, and creative publications. The club will meet on Thursdays after school, from 2:45 p.m. to 4:15 p.m. in the HFS Library. Pickup time will be 4:15 P.M at the gym. Your child will be in aftercare (in the art room or playground) after this time. Newspaper Club will cost $10 to join for the year for the journalists’ supplies and computer program expense. Please send registration fee to Rita Hart c/o Kathryn Hart, 3B. Checks are to be made payable to HF HSA. School Spirit Days are coming! Holy Family spirit on these designated days. ***NEW Deadline for ordering is Sept. 28. You can also use the attached Order Form. NOTE: Students will have an opportunity to wear their Spirit clothes during upcoming scheduled "Spirit Wear Days". Spirit Wear may be purchased at certain times throughout the school year. During designated Spirit Days students are permitted to wear HFS Spirit clothing. Spirit Days are meant to build enthusiasm and a sense of school community and this is your chance to show your HFS school spirit but participation it is not obligatory. Students can also wear their regular uniforms those days if they choose not to wear Spirit Wear. Gym uniforms are not a substitute for Spirit Wear, unless the student has gym class scheduled for that specific day. However, students are allowed to wear Spirit Wear to their gym classes that day as long as they wear appropriate gym shoes for their class. High School 101 will be held on Thursday, Sept. 28 at Notre Dame High School in Easton. All eighth-grade students should report to the Notre Dame gym no later than 8:15 a.m. Please be sure to have your Notre Dame permission form! Want to meet your son or daughter’s teacher? Great! “Meet the Teachers Night” is tonight!. There will be three sessions, so listen up. Session I and II are slated for meetings with the kindergarten through fifth-grade homeroom teachers or special teachers for all grades. The Special teachers include the subjects: art, computer, physical education/health and Spanish. These teachers will be available to speak with parents in Room 108. The first session is from 6:30 to 6:45 p.m. and the second session is from 6:50 to 7:05 p.m. There will be five minutes between the sessions for room change. After the second session, everyone should make their way to the gymnasium for “Welcome and General Teacher Introduction.” The welcome will run from 7:10 to 7:25 p.m. Following the welcome, grade sixth through eighth will report to their first period class on the Friday schedule. This is Session III and will run from 7:35 to 8:33 p.m. The schedule is as follows. Period 1 – 7:35 to 7:43 p.m.
Period 2 – 7:45 to 7:53 p.m.
Period 3 – 7:55 to 8:03 p.m.
Period 4 – 8:05 to 8:13 p.m.
Period 5 – 8:15 to 8:23 p.m.
Period 6 – 8:25 to 8:33 p.m. The evening will conclude at 8:40 p.m. Thank you for your dedication to your children’s education. The Helping Hands Club will hold their 8th Annual Gently Used Clothing Drive on Saturday, July 15 from 9 to 11 a.m. This drive helps families in the community find affordable summer and back-to-school clothing for their children. No prices are set, but donations are gratefully accepted; these donations are then donated to the parish SOS fund to help other families in need. New and gently used closing donations for infants, children and teens will be accepted at all Holy Family Masses the weekends of July1-2 and July 8-9. Holy Family School and parish students who would like to help sort clothes in the church parking lot on the morning of the sale, should contact by email either Kathi or Robin. Thank you! Sign-ups for the 2017 Holy Family Cross Country Team are just around the corner; on Sunday, June 25 and Sunday, July 16 from noon to 1:30 p.m. next to the Holy Family Gym under the Playground Pavilion. Holy Family School and Holy Family Church children who are going into grades Kindergarten through 8th are welcome to join. Click here for more information, or contact Coach Linda Karavitch by phone at 610-564-1372 or via email. The ever-popular Mad Science Summer Camp for ages 5-12 is back! The camp will be held from Monday, June 26 through Thursday, June 29 from 9 a.m. to 12 p.m. each day. The theme is "Claws, Codes & Constellations" and the cost is $150 per child. Check out more information and the registration form right here. Soccer has come to HFS! Holy Family School is teaming up with Bethlehem Steel FC to present Steel Soccer Sessions for Grades K-8, with no experience necessary! Sign-ups end when the limit is reached or by April 14. The cost is only $10 per child and includes one ticket to a Bethlehem Steel FC game on April 29. Register here and now! Grades 1 through 4 students now have the opportunity to learn the basics of STEM/STEAM (Science,Technology/Arts, Engineering and Math) and Coding (learn how to think like a computer and have fun programming robots!). This club will meet on Thursdays after school from 2:45 to 4 p.m. for four weeks, on April 6, 20, 27 and May 4 (school is closed April 13). Cost is just $10 per students. There is still room and time to sign and send in your registration form! Questions? Please contact Mrs. Whitman by email. HFS families, bring your friends and neighbors to our Annual Art Show & Open House, scheduled for Wednesday, April 5 from 6 to 8 p.m., beginning in the gym. Tours and information will be availiable for those new to the school, and current famiilies who refer a new family that subsequently enrolls their own child(ren) will receive a $100 credit against the 2017-2018 tuition! A win-win for everyone! School Spirit Days are almost here! The first of three School Spirit Days is fast approaching. Show your school spirit with what you wear. Parents, here are some helpful guidelines for those days. The new line of Spirit Wear can still be purchased for the future Spirit Days of March 22 and May 18. Holy Family School, like so many other schools in our district and beyond, has been hit hard in this cold and flu season. Take time to brush up on these reminders, and remember to wash hands frequently and keep your children home if symptoms show up, for their protection and that of others. Action Karate of Nazareth entertained and enlightened our student body with a great assembly during Catholic Schools Week. This great organization is now offering our students a special offer, with 100 percent of the proceeds to be returned to Holy Family School. Thank you, Action Karate, for all you do! Registration for the 2017-2018 school year has now opened, for both new students and re-registering students. Information on registering a student in Kindergarten through 8th Grade is now available. Registration is also open for our Preschool programs. Holy Family School is proud to announce the addition of Tennis Club! Open to all in Grades 5-8, no experience is necessary, and thanks to a USTA Grant, it's free! Sign up now, as space is limited and deadline for registration is February 1, 2017. The Call of the Faith - Read all about it! The HFS Newspaper Club is proud to announce the First Edition of The Call of the Faith, HFS' first online publication! Written and produced by our students from Kindergarten through 8th Grade, we hope you will take the time to relax and read the fruits of their labor. Enjoy! Holy Family School's 8A class is sponsoring a Coat Drive. Gently used, clean coats are being accepted at HFS from Monday, Jan. 9 through Friday, Jan. 20. The coats will be donated to St. Joseph's Ministry in Wind Gap. This 8th grade class would like to thank all in advance who give this gift of warmth! We are now in the second phase of early re-registration for existing Holy Family School students, and we encourage families to take advantage of the $100 re-registration fee between now and February 3, 2017 to guarantee a spot for the 2017-2018 school year! For the first time, we are offering a 3-tiered registration fee schedule. The instructions for re-registering early through FACTS are self-explanatory, but should you have any questions regarding re-registration, please contact the HFS office at 610-759-5642. To make re-registering fun for the school, each student who re-registers early will be acknowledged with an Olympic gold medal that will be hung outside of their homeroom. On February 3, 2017 (the last day of Catholic Schools Week 2017), the homeroom with the most medals will win a pizza party at school! Logan Winchester, Class of 2007, was a three year varsity baseball player for the Crusaders from 2005-2007. While at Notre Dame he was named as a first team All-Area selection by both the Morning Call and the Express-Times in 2007. During that same year, he was a first team selection for the Colonial League, first team All-State selection and Morning Call Player of the Year. He went on to play and graduate from Lehigh University and was second team All-Patriot League. Nick Bender, Class of 1996, was named second team All-State as a member of the Crusader football team during his 1995 season. He was first team all-area and all-conference as well as a three year starter for the Crusaders. He was also a member of the Crusader track team where he was an accomplished sprinter and threw the shot put and discus. He went on to play football for Wake Forest where he was a three year varsity letter winner. John Gardoski, Class of 1960, was a member of the Crusader football and track teams. On November 9, 1957, John scored the first ever touchdown for the Crusaders in a game against Phillipsburg Catholic High School when he ran from scrimmage for a 99 yard touchdown. This run is still the longest touchdown run from scrimmage in school history. In 1958 he was named a member of the first team East Penn All Catholic League and second team in 1959. He went on to earn a degree in Art Education from Kutztown University. The 1994-95 girls basketball team achieved a record setting season with the most wins in school history for both boys or girls basketball and won four straight District XI titles. They were undefeated in the Colonial League and had a season record of 30-2. They won the District XI championship in AA that season and were state quarter finalists. The team was coached by Traci Cyr and Jerry Gross. Team members include: Julie Amato, Sue Farina, Allison Lucey, Sara Singley, Sharon McElrone, Nicole O’Mailia, Colleen Mack, Amber Csaszar, Sara Niper, Lisa Briener, Reina Mast, Mary Herkalo, Beth Hudak, Betsy Swartz, Erica Schlamp and Allyson Buss. The Wrestling Teams from 1965, 1966 and 1967 will also be inducted into the Hall of Fame. During these three seasons the Crusaders captured three consecutive PCIAA State Wrestling Championships. All coaches and team members will be inducted as a group into the Hall of Fame for their accomplishments. The new members will be inducted on Friday, January 13, 2017 prior to the start of the boys’ basketball game in the Notre Dame gymnasium. A reception will be held prior to the induction in the school’s cafeteria. For information, contact the Alumni office at alumni@ndcrusaders.org or call 610-868-1431 x111. Holy Family School is proud to announce the addition of another new club for our students! Chess Club, for Grades 1-8, will meet after school on Mondays from January 10 to February 27 (with the exception of Martin Luther King Day and Presidents Day). The cost to join is just $5 per student. For more information, check out our registration form. Space is limited, so sign up now! As always, our Parent Information (a/k/a the Brown Envelope), will be coming out on Thursdays. To locate it on our new website, hover over the "For Parents" tab at the top of the homepage, and click on "Parent Information" (a/k/a Brown Envelope)". To access the information, you'll need your user name and password for your RenWeb account. Please note: the previous way of logging on to view the Brown Envelope is no longer in effect. Extra! Extra! The Newspaper Club is here! HFS is excited to announce the formation of its Newspaper Club! Open to aspiring journalists and photographers in grades K through 8, the club will publish an online newspaper three to four times a year. Come join us as we meet for the first time to decide on a newspaper name and more on Monday, Nov. 14 from 2:45 to 3:45 p.m. in Room 108 (Mrs. Hart's room). Take a look at the registration form and even more information and sign up soon - space is limited! The STEM and Coding Clubs have arrived! HFS is proud to announce the addition of two brand-new Clubs for students in Grades 5 through 8! Sign-ups are happening now and space is limited, so don't delay in registering to become part of these fun activities. The STEM Club starts November 3 and the Coding Club on November 10. For lots more information, check out our STEM/STEAM registration form and our Coding Club registration form. HFS would like to extend heartfelt thanks to Mrs. Marjorie Joseph, Mrs. Heather Sterling, Mrs. Melissa Whitman and faculty member Mr. Joseph McMaster for making these wonderful clubs a reality! Halloween Parade great fun - and we won! A huge "THANK YOU" to all those who participated with HFS in this year's Nazareth Halloween Parade on Saturday! God gave us perfect weather, a wonderful crowd (with a built-in cheering audience) and loads of fun. We were happy to learn later than HFS earned Second Place in the Large Division category of the parade. We hope you all can come out next year and join in the fun! We're excited to announce the September calendar has been updated and is now online, with both an interactive version that allows you to learn more about an event by clicking on that event, and also with a printable version for your personal use. To access the calendar, click on "Calender" at the top right side of the HFS homepage. From there, you may click on any individual entry to learn more. If you wish to print the calendar to keep handy, simply hit the printer icon after you bring the calendar up on your screen (the view of the calendar will change) and print. Thank you for your patience as we begin a new year, with a new calendar, and new staff!